The first four of the 12 riders on the Nature Valley Pro Ride men’s and women’s teams have been selected, with the next two to be determined in Oregon this weekend. Women’s qualifiers are Kristen Meshberg of Lyons, Ill., from the Hillsboro-Roubaix Road Race near St. Louis and Monroe, Ga., resident Nancy Jones, from the Rock Hill Spring Bicycle Classic in South Carolina. Jones, riding for Subaru Gary Fisher Road Cycling Team, is a past Georgia state time trial champion who finished third in that discipline at last year’s USA Cycling Masters Road National Championships. Meshberg rides for the Flatlandia Cycling Team and said she is “super excited” to be part of the Nature Valley Pro Ride. Men’s qualifiers are Zach Garrett of Sumter, S.C. and Lawrence, Kan., resident Joseph Schmalz of the Mercy Cycling Team. Garrett races for U.S. Military Cycling. To accept the Nature Valley Pro Ride invitation, he first had to receive permission for time off from his commanders at Shaw Air Force Base. Nature Valley Pro Riders who are invited to compete in the Nature Valley Grand Prix earn free entry to the race, generous travel stipends, team clothing, housing, ground transportation, and staff support for their composite teams. They also receive pro-level recognition before, during and after the events, including pre-race call-ups and participation in promotional and media appearances. This weekend marks the next stop on the Nature Valley Pro Ride national tour. The Cherry Blossom Classic presented by Waters Edge Health and Wellness Center takes place Friday through Sunday in the Portland, Ore., area. Qualifiers will be based on the final overall standings in the three-day event that includes a road race, circuit race, time trial and criterium. The other remaining Nature Valley Pro Ride events are: Barrio Logan Grand Prix/Mark Reynolds San Luis Rey Cycling Classic (May 1-2) in California, Bear Mountain Spring Classic (May 16) in New York and Mt. Hamilton Classic Road Race/Memorial Day Criterium (May 30-31) in California. Spring is here. A month early. And for Minnesota, that’s huge. It means old man winter took a short cut of four weeks – and that means a full extra month of warmer weather in the Upper Midwest. So it’s time to turn our attention to the Nature Valley Grand Prix. Perhaps the most exciting news for the race this June is that Nature Valley Granola Bars has become the title sponsor for the 10-day festival. We’re now known as the Nature Valley Bicycle Festival featuring the Nature Valley Grand Prix. What’s more, we’re bringing back Velodrome racing as the precursor to the Grand Prix stage race. The National Sports Center in Blaine, Minn., will host the track races just as it did in 2008. The Fixed Gear Classic velodrome races start June 11 and the Nature Valley Grand Prix gets under way on June 16 in Saint Paul, finishing in Stillwater, Minn., on June 20. 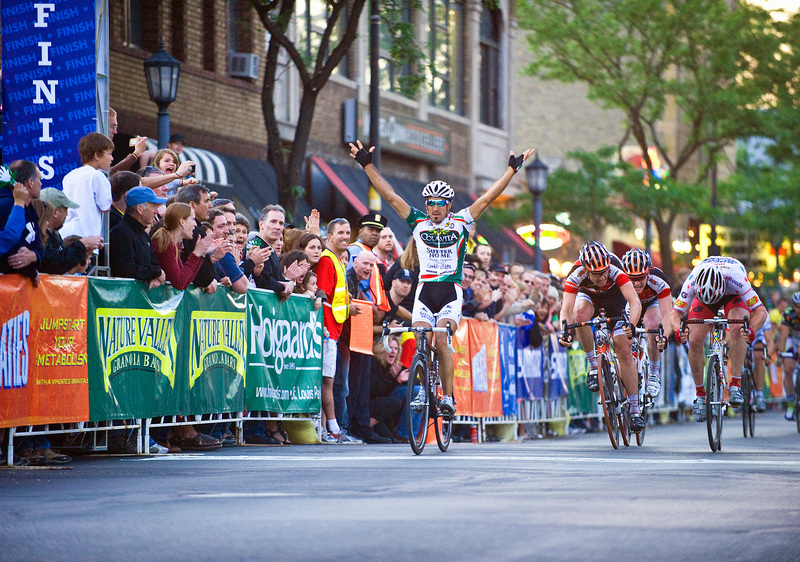 One additional element to this year’s Grand Prix is a new Stage 5 race in Menomonie, Wisc. That’s right, the Grand Prix leaves the confines of Minnesota’s borders to conduct a brutal road race stage in the hills surrounding Menomonie – just 45 miles east of the state line. This new stage is sure to leave pro teams talking – or having nightmares. I plan to continue reporting on the main events here throughout April, May and June, so check back often. If you live in the Twin Cities region, the coordinators of the festival are in need of volunteers to host cyclists throughout race week (June 14 – 21), so please consider opening your homes (and extra beds) up to these world-class racers.